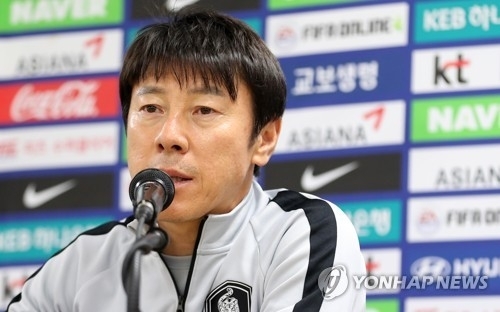 DAEGU, May 27 (Yonhap) -- South Korea football coach Shin Tae-yong said Sunday his side will use a back four system in the upcoming friendly match against Honduras. South Korea, ranked 61st in the FIFA rankings, will host No. 59 Honduras at Daegu Stadium in Daegu on Monday. It will be South Korea's first match since they announced a provisional squad for the 2018 FIFA World Cup on May 14. "I can't tell details, but tomorrow, we'll use a four-man defense," Shin said at a pre-match press conference in Daegu. "We'll try to check existing players and new faces' ability to execute our game plan." South Korea have been suffering from a series of injuries, and Shin previously said he's thinking of changing their main tactics with a 4-4-2 formation. "We'll see some player rotation, but I have no doubt that our players will give their 100 percent effort on the pitch," he said. "This is the first international match in Daegu in 13 years, so we'll try to play a good game." Shin originally called up 28 players for the provisional World Cup roster, but Dijon FCO midfielder Kwon Chang-hoon and Gangwon FC forward Lee Keun-ho were dropped due to injuries. To prevent further injuries, Shin said four players -- Ki Sung-yueng, Lee Jae-sung, Jang Hyun-soo and Kim Jin-soo -- will not play against Honduras. Kim, a left back from Jeonbuk Hyundai Motors, is recovering from a left knee injury that he sustained in March, while Jang, a center back from FC Tokyo, is dealing with an ankle injury. Shin said Lee isn't injured, but he decided to give the Jeonbuk midfielder a rest after Lee went through a tight schedule with his club. Shin added that team captain Ki will be also left out as the Swansea midfielder is having a lower back problem. Ki was looking for his 100th international cap against Honduras. Despite the injuries, Shin, who has been leading South Korea since July 2017, said his team is keeping a good atmosphere. "I thought our team atmosphere would go down because of injured players, but I liked that every player stayed focused and enjoyed training," he said. "We're getting better as the players are communicating with each other frequently."